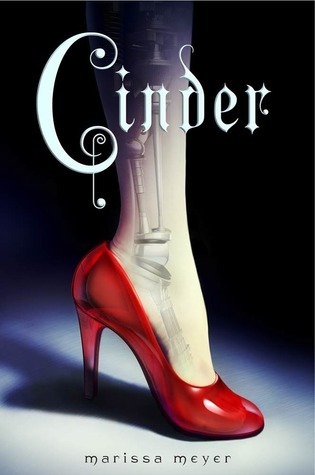 Firstly – not an area I usually focus on – but the cover for this is absolutely perfect, with the traditional foot and slipper image of Cinderella, with the lovely text superimposed over the top of the robotic body parts – fantastic! I really liked the sound of this – futuristic re-telling of Cinderella with the poor servant girl recast as a second-rate citizen cyborg…great idea. And the novel itself is good – I read through it at a pace, liked the characters and thought the ‘robot’ elements were well done. The climatic ballroom scene as well held enough twists to keep it interesting, despite my having guessed (probably like most people) the biggest plots twists that were going to come. This is probably the first ‘robot’ novel I’ve read since ‘Do Android’s Dream of Electric Sheep?’ – interestingly it covers many similar themes: if people are ‘human’ in all behavioural aspects, have human thought processes and look human, but they just have some cables and wires in there instead of veins, does it actually make them ‘less’ than human? Cinder has a second-rate status due to her being a cyborg (a condition she woke up in after an horrific accident, rather than some random Frankenstein-type experiment). Overall, interesting ideas and nicely written, a little predictable, but I think it has to be to stick within its roots as a fairytale, so that’s not necessarily a criticism. I’ll definitely be looking out for the next one to see where things go as I think it has scope to be a good series. This entry was posted in Reviews and tagged cinder, cinderella, fairytale, marissa meyer, review, twist. Bookmark the permalink. It was my very first cyborg novel ever so I definitely understand what you’re saying. I really liked it even through the obvious plot foreshadow (that was disappointing though). I definitely agree and I liked it enough to keep reading. Shame we have to wait until 2013.